All writing is the property of their respective authors. Frail cracked hands fisted in locks of damp water clogged hair, the points of Bill Compton's teeth scratched along the crackled surface of his lower lip. Peeling off the thin layer of skin on his lip he could taste his own blood. With the lack of blood in his system and all the True Blood factories still burnt to the ground and no the ones that were re-located were no longer supplying. Bill knew that with Fangtasia closed permanently until clean blood was available there was going to be more vampire related deaths in the area. But there was only so much that Bill could do, with his Kingdom in a state of panic over the lack of blood in the area and territories. With the mounting problems already piling high on his plate he was already the strain on his shoulders. With a spoilt Willa Burrell running around causing enough problems that would keep him occupied for weeks. Bill did wonder why Northman had turned her, he had left behind a problem that he was now having to deal with. He had expected Tara to cause him some problems but in the end it was Willa Burrell. 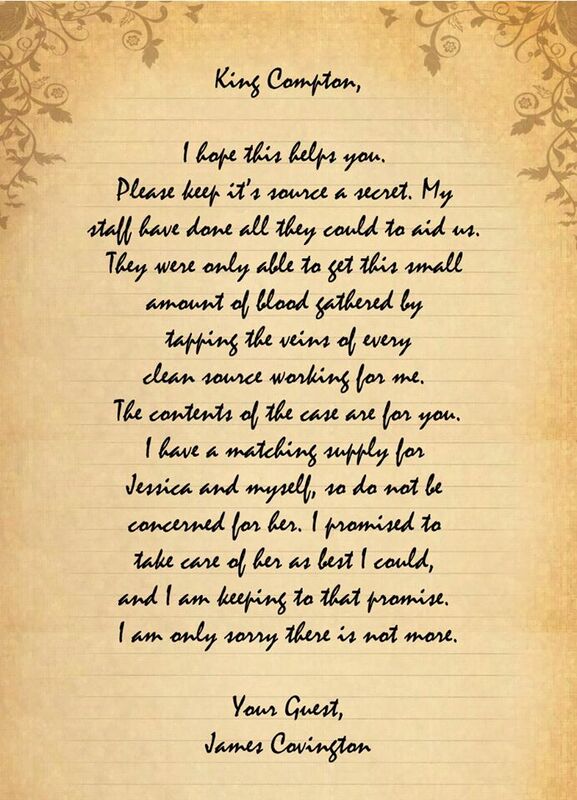 Opening the small box on his desk, inside it contained a small bottle of blood. Without hesitating he snapped up the bottle, opened it and drained the contents of it quickly. Bill could already feel the blood slowly working though his system, his once paler colour skin was slowly regaining its colour. His mind was already becoming clearer and more focussed. But he knew that it would not last for long, using what stability he had he picked up his cell and hit dial. "This is Bill Compton. I want every sheriff of Louisiana at my home tomorrow evening....We have a problem" he sighed heavily.